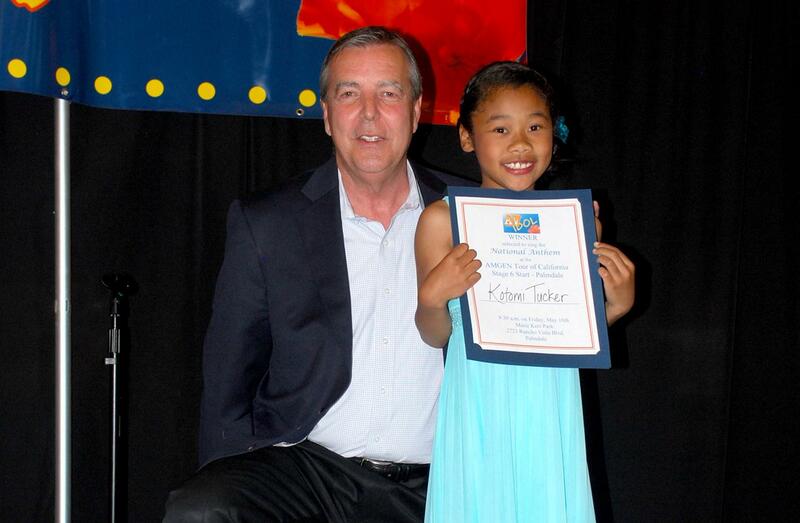 Eight-year-old Kotomi Tucker, right, was all smiles when Palmdale Mayor Jim Ledford announced that she would be singing the National Anthem at the start of Stage 6 of the Amgen Tour of California coming to Palmdale on May 18. PALMDALE – Eight-year-old Antelope Valley resident Kotomi Tucker was a double winner last night at the AV Idol singing contest held last night at Center Court at the Antelope Valley Mall, first taking home first prize in the youth category, and then being selected from all the finalists to sing the National Anthem at the start of Stage 6 of the 2012 Amgen Tour of California, coming to Marie Kerr Park in Palmdale on Friday, May 18. The festivities for the Amgen Tour of California will begin at 8:30 a.m., on May 18, with food, merchandise, displays and the arrival of the team buses. The starting gun will go off at 10:25 a.m. sharp. The event is free and open to the public. Race attendees will have the rare opportunity to see world class Olympic and Tour de France athletes up close and personal. Fans may get autographs of the riders in their free Palmdale souvenir magazines that will be available at the event prior to the start of the race. The largest cycling event in America, the 2012 Amgen Tour of California is a Tour de France-style cycling road race, created and presented by AEG, that challenges the world’s top professional cycling teams to compete along a demanding course from May 13-20, 2012. The race in Palmdale on May 18 will begin at Marie Kerr Park with the firing of the official start gun at 10:25 a.m. Riders will leave Marie Kerr Park in a neutral start and head east on Rancho Vista Blvd., a flat straightaway past the heart of Palmdale’s busy retail center and Antelope Valley Mall, under the 14 Freeway, and past iconic Joshua trees in springtime bloom, until taking a hard right onto historic Sierra Highway, where the race begins in earnest. Formerly the El Camino Sierra Trail used by prospectors and adventurers in the 19th century, Sierra Highway is part of Historic Route 6. Riders will race along this nostalgic thoroughfare, passing Palmdale’s state-of-the-art Transportation Center, beautiful desert landscape, and picturesque Lake Palmdale at 2,980 feet above sea level before turning onto Pearblossom Hwy. As the riders veer left onto Angeles Forest Hwy. from Pearblossom Hwy., they will begin their arduous ascent into the San Gabriel Mountains, the first of two grueling uphill climbs of the day. This stage of the race is 115+ miles long. For further information on the 2012 Amgen Tour of California, and to view the 2012 Amgen Tour of California Host Cities video, visit www.amgentourofcalifornia.com.